Sandro Botticelli (1445–1510), Idealized Portrait of a Lady (Portrait of Simonetta Vespucci as Nymph) (1480), media not known, 81.8 x 54 cm, Städelsches Kunstinstitut und Städtische Galerie, Frankfurt, Germany. Wikimedia Commons. Three years ago, on the fifth of November 2014, a very unusual painting was auctioned in New York. Although made in 1922, it was no modernist work, but captured on its canvas were the faces of those long dead. Figures such as Sandro Botticelli and members of the Medici family, who had last been seen in the flesh over half a millenium ago. 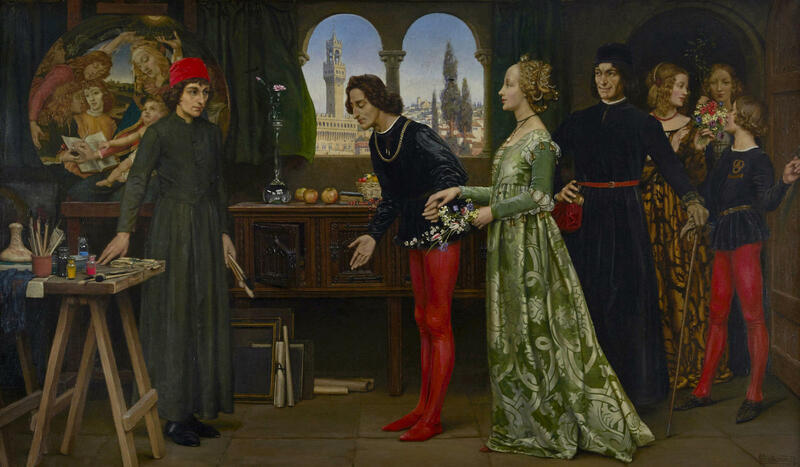 Eleanor Fortescue-Brickdale (1872–1945), Botticelli’s studio: The first visit of Simonetta presented by Giulio and Lorenzo de Medici (1922), oil on canvas, 74.9 × 126.4 cm, Private collection. Wikimedia Commons. The painting’s title reveals its key figures: Botticelli’s studio: The first visit of Simonetta presented by Giulio and Lorenzo de Medici (1922). 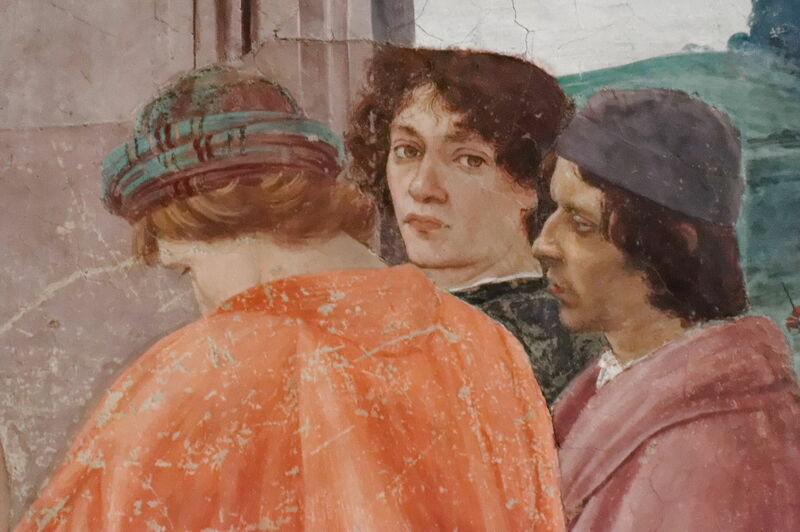 Sandro Botticelli stands at the left, in front of an exquisite tondo which he is working on. Bowing to him at the centre is Giuliano de’ Medici, who is accompanied by Simonetta Vespucci, wearing the green dress. Behind her is Lorenzo de’ Medici, also known as Lorenzo the Magnificent, and behind him are Giovanna Tornabuoni and her attendants. The view through the window is of the Palazzo Vecchio in the centre of Florence. These figures were not painted from models, or imagination, but each is based on contemporary sources. 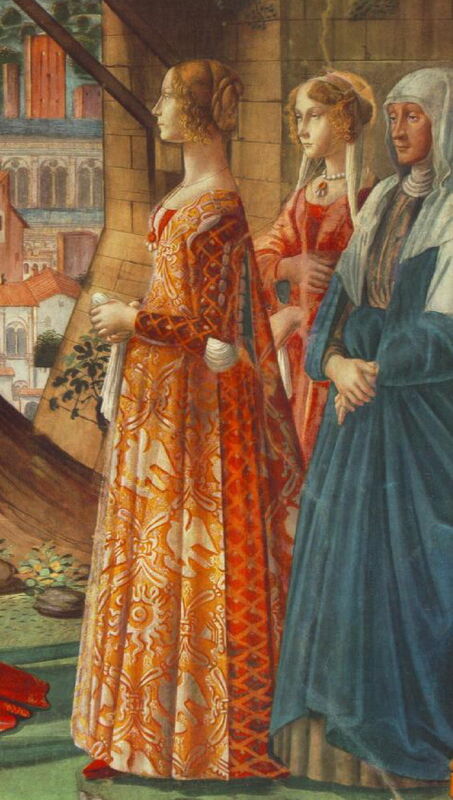 Domenico Ghirlandaio (1449–1494), Giovanna Tornabuoni and attendants, detail of The Visitation (c 1488), fresco, dimensions not known, Tornabuoni Chapel, Santa Maria Novella Church, Florence. Wikimedia Commons. Giovanna Tornabuoni comes from a detail of Domenico Ghirlandaio’s painting The Visitation (c 1488) in the Tornabuoni Chapel of the Church of Santa Maria Novella in Florence. Giovanna was born as Giovanna degli Albizzi in 1468, married Lorenzo Tornabuoni in 1486 when she was about eighteen, and died in childbirth two years later in 1488. She is here accompanied by her maid, and her nurse. Girolamo Macchietti (1535–1592), Lorenzo the Magnificent (Lorenzo de’ Medici (1449-1492)) (date not known), oil, dimensions not known, location not known. Wikimedia Commons. 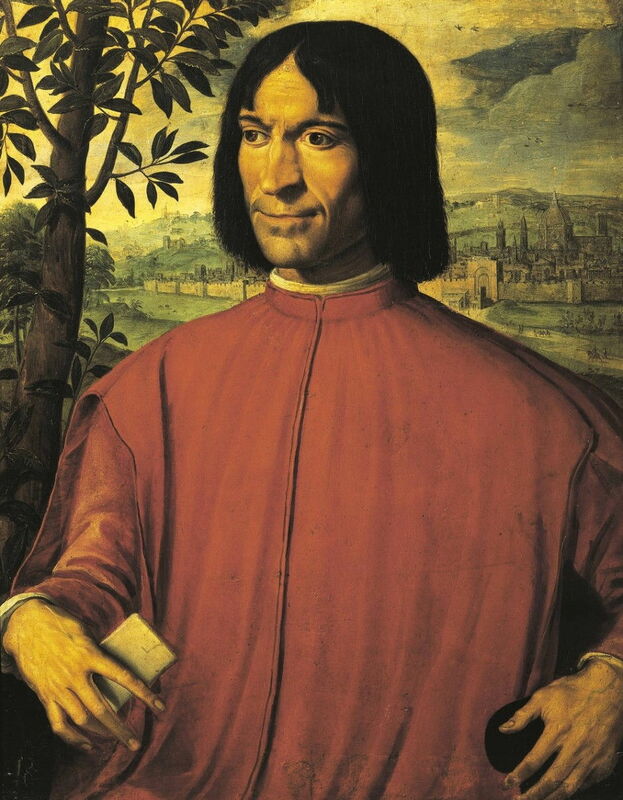 Lorenzo de’ Medici (1449-1492) appears in Girolamo Macchietti’s undated portrait of Lorenzo the Magnificent. Lorenzo was born in 1449 into the banking family, the grandson of Cosimo de’ Medici, one of the wealthiest and most powerful people in Europe. Lorenzo was groomed for power, and became the de facto ruler of the Florentine Republic when his father died in 1469. He survived an attack in the Cathedral of Santa Maria del Fiore on Easter Sunday 1478, in which his brother Giuliano was stabbed to death. This led to his excommunication, and invasion by forces of the King of Naples. He resolved that, and died in 1492, when he was forty-three. Sandro Botticelli (1445–1510), Portrait of Giuliano de’ Medici (c 1475), tempera on panel, 54 x 36 cm, Accademia Carrara, Bergamo, Italy. Wikimedia Commons. 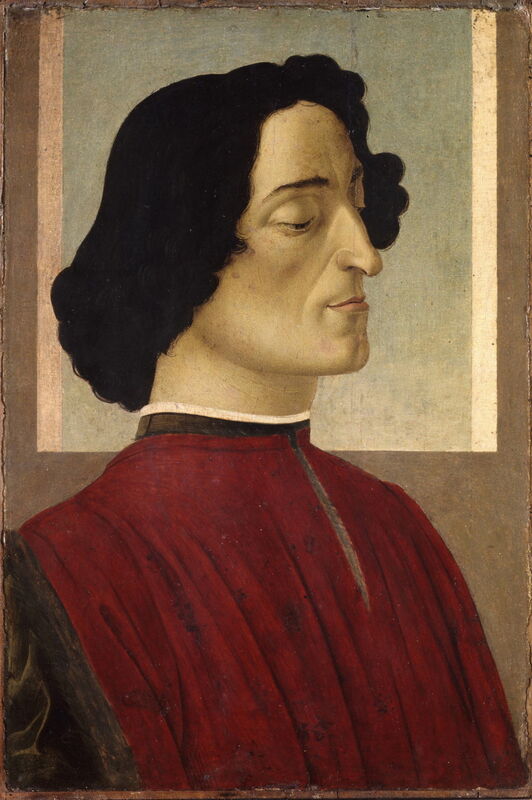 It was Sandro Botticelli who painted this Portrait of Giuliano de’ Medici in about 1475. Giuliano was born in 1453, younger brother and co-ruler of the Florentine Republic with Lorenzo. He was assassinated in the attack in the cathedral on Easter Sunday 1478, dying at the age of twenty-five. Although he never married, an illegitimate son of his went on to become Pope Clement VII. 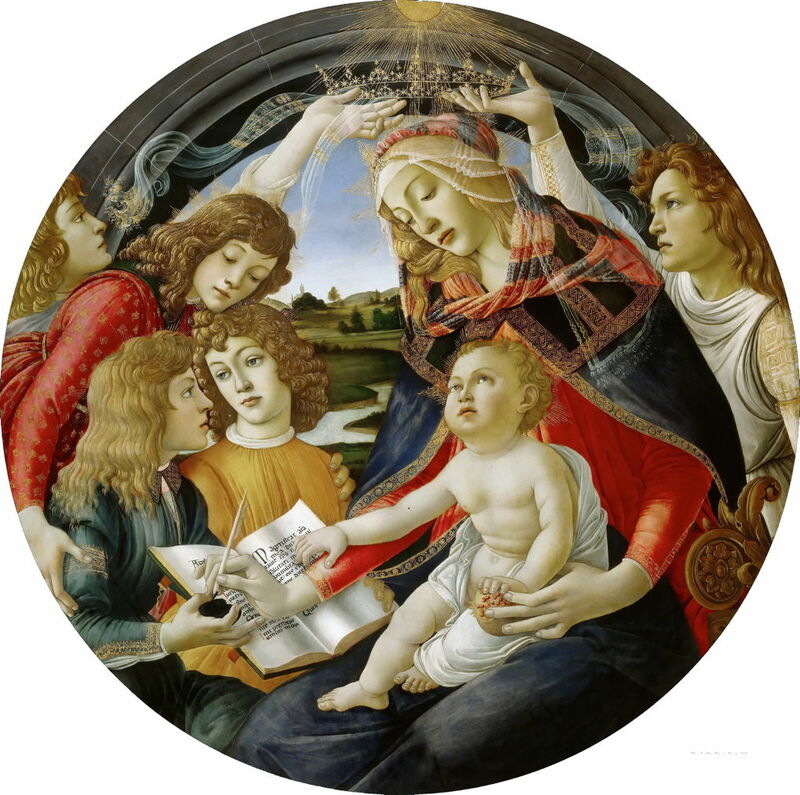 Sandro Botticelli (1445–1510), Madonna of the Magnificat (1483), tempera on panel, diameter 118 cm, Galleria degli Uffizi, Florence. Wikimedia Commons. The painting shown in progress is Botticelli’s Madonna of the Magnificat, which is believed to have been completed in 1483. It shows the Virgin Mary being crowned by a pair of angels, writing down the start of the Magnificat in a book, and holding a pomegranate in her left hand. It has also been interpreted as a family portrait of the de’ Medicis, in which the Virgin is Lucrezia Tornabuoni, the mother of Lorenzo and Giuliano de’ Medici, who are the angels. I believe that Lucrezia was one of Giovanna Tornabuoni’s aunts by marriage. Sandro Botticelli (1445–1510), The Adoration of the Magi (detail) (c 1475), tempera on wood, dimensions not known, Galleria degli Uffizi, Florence. Wikimedia Commons. The figure of Botticelli is a little more difficult, as he is not known to have painted a formal self-portrait. It is generally believed, though, that he showed himself in cameo in this detail from The Adoration of the Magi (c 1475). Filippino Lippi (1457–1504), Disputation with Simon Magus and Crucifixion of St Peter (detail) (1424-28), fresco, dimensions not known, Cappella Brancacci, Santa Maria del Carmine, Florence. Image by Marie-Lan Nguyen, via Wikimedia Commons. It is also thought that Filippino Lippi included his portrait in this section which he painted in 1483-84 of Massaccio’s incomplete fresco in the Cappella Brancacci, Santa Maria del Carmine, Florence, in Disputation with Simon Magus and Crucifixion of St Peter. 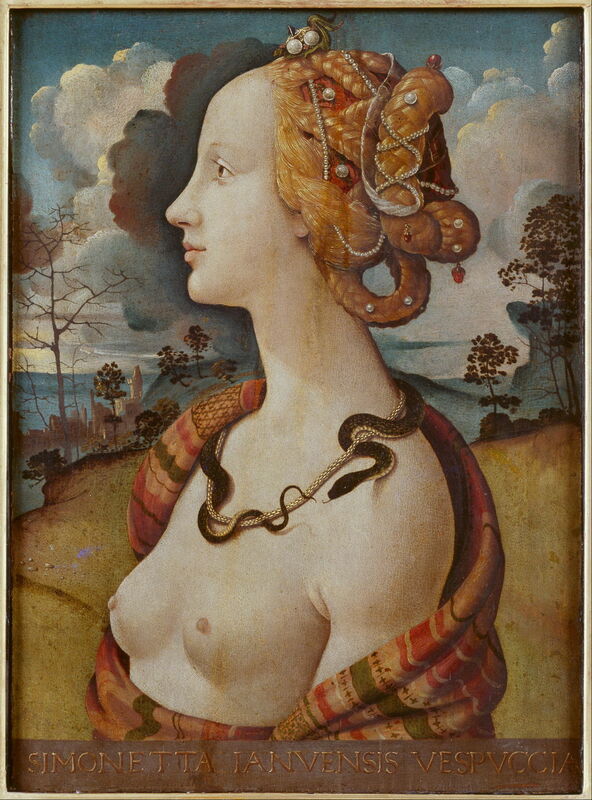 But of all the figures shown in this painting, Simonetta Vespucci is the most fascinating. She was born Simonetta Cattaneo in 1453, and when she was only fifteen or sixteen, she married Marco Vespucci, the cousin of Amerigo Vespucci, who was the first to demonstrate that the New World of the West Indies and Brazil was not part of Asia. Once married, she lived with her husband in Florence, where she was a great favourite at the court of the de’ Medicis. 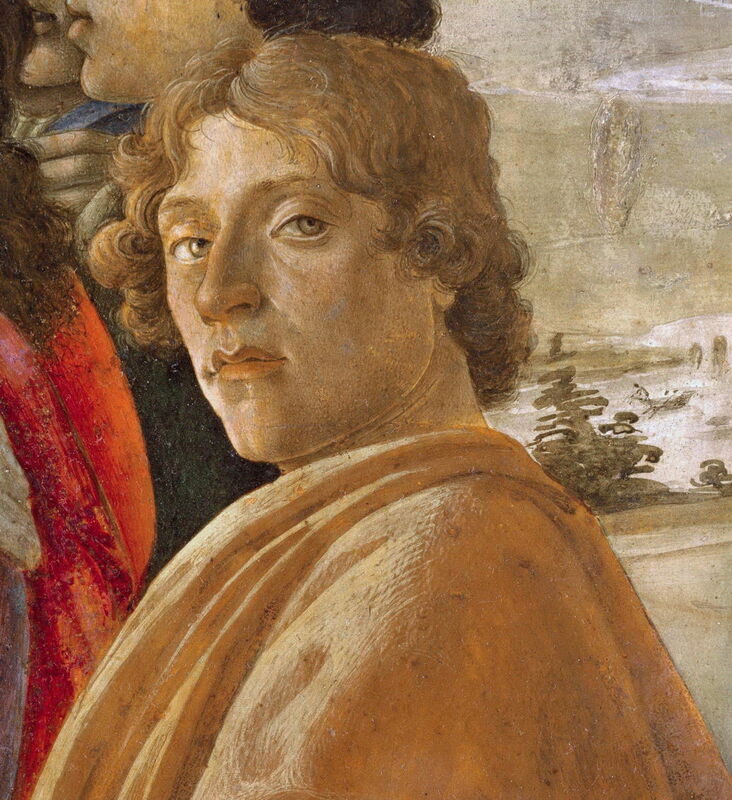 Giuliano de’ Medici entered a jousting tournament in 1475 bearing a banner on which Botticelli had painted an image of Simonetta as Pallas Athene. She had the reputation of being the most beautiful woman in the whole of northern Italy. 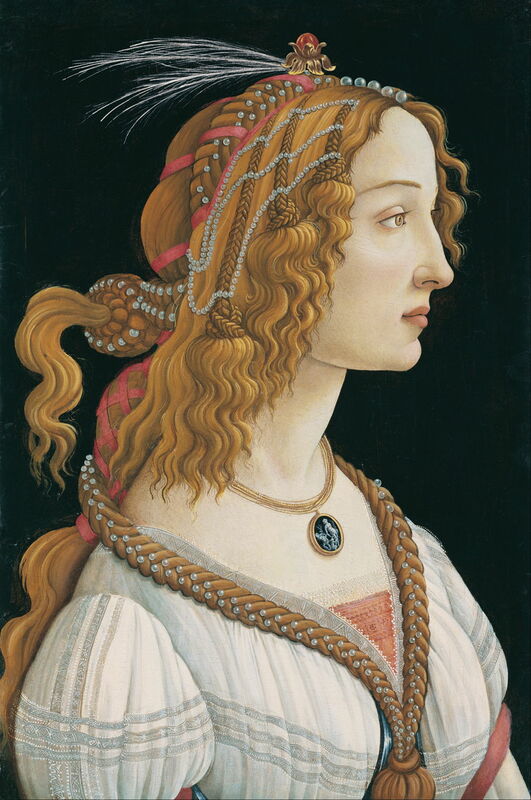 Simonetta’s beauty was not to last long: she died of tuberculosis in 1476, when she was only twenty-two. Piero di Cosimo (1462–1521), Portrait of Simonetta Vespucci (1490), media not known, 57 x 42 cm, Musée Condé, Chantilly, France. Wikimedia Commons. There are many paintings which are claimed to have been portraits of her, but perhaps the most credible is Piero di Cosimo’s Portrait of Simonetta Vespucci (1490). Several of Botticelli’s works have been claimed to feature figures for which Simonetta modelled – even the naked Venus in The Birth of Venus (1484-86). The least unlikely might be his Idealized Portrait of a Lady, also known as Portrait of Simonetta Vespucci as Nymph, which is thought to have been painted in 1480, four years after her death. Such portraits were commonly not true to life, but idealisations intended to flatter rather than identify, so we will never know if she was its subject. Inevitably, time is slightly out of joint. The figures might have been able to gather together in this way in about 1475, before the deaths of Simonetta and Giuliano de’ Medici, but that is well before Botticelli might have painted Madonna of the Magnificat, and when Giovanna Tornabuoni was still a child. Who was painting about the history of painting, that of Florence and the Renaissance, in 1922? You will almost certainly not have heard of Eleanor Fortescue-Brickdale (1872–1945), the artist who was responsible for this superb example of history painting. Not only that, but this was her second work of its kind. Eleanor Fortescue-Brickdale (1872–1945), The Forerunner (1920), oil on canvas, 59.6 × 122 cm, Lady Lever Art Gallery, Liverpool, England. Wikimedia Commons. 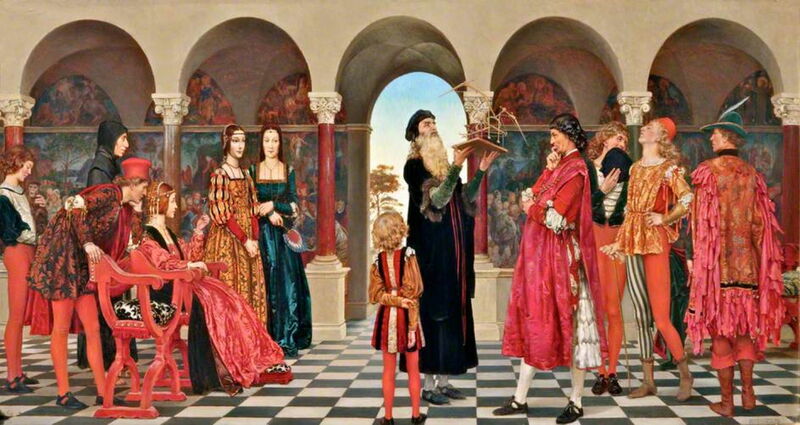 Two years previously, in 1920, Eleanor Fortescue-Brickdale had painted The Forerunner, which shows Leonardo da Vinci trying to convice the Milanese court of his idea for flying machines. The notable figures included here are (from the left) Savonarola (from Fra Bartolomeo’s portrait), Beatrice d’Este (Duchess of Milan), Cecilia Gallerani, Elisabetta Gonzaga, Leonardo da Vinci, and Ludovico Sforza (Duke of Milan, and Leonardo’s patron). Eleanor Fortescue-Brickdale sold The Forerunner to Lord Leverhulme, and it is now on view in the Lady Lever Art Gallery. In 1922 she was commissioned to paint Botticelli’s Studio for Montague Rendell. The latter was shown at the Royal Academy later that year, but has been in a succession of private collections since. Who was Eleanor Fortescue-Brickdale? I will explain in the next article tomorrow. Posted in General, Life, Painting and tagged Botticelli, da Vinci, di Cosimo, Fortescue-Brickdale, Ghirlandaio, history of painting, Lippi, Macchietti, narrative, painting, Piero di Cosimo. Bookmark the permalink.